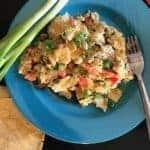 Migas is a scrambled egg dish, with corn tortillas, onions, peppers and seasonings, and is most commonly found on the menus of restaurants in South Texas and as far north as Austin. As I write this post, I am texting with a friend who asked me, “what’s a miga?” Good Lord. He’s been in Texas for 30- some-odd-years-now and doesn’t know what migas is? Crazy. 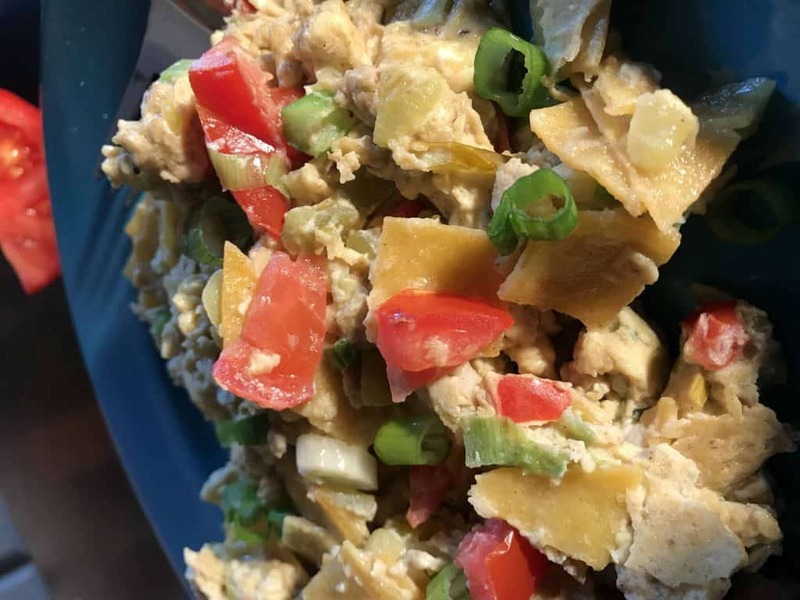 And then there’s my mother-in-law, who informed me 18 years ago, (after two months of marriage),” John won’t eat eggs.” Hmmph… “he eats Migas!,” I said. Again, she had no clue as to what I was referring. Corn tortillas are a staple ingredient in this dish, even if they’re stale. The tortillas are basically fried, or sauteed (either way, depends on if you like crunchy stuff in your eggs), then mixed in with onions, tomatoes, peppers and beaten eggs. The dish is cooked on the stove and once the eggs are done, top the migas with a little cheese and Chow Down! Some people add meat to their migas, typically chorizo, which is a spicy sausage. And some people throw in some black beans–it’s really your call, but the seasonings are always the same: cumin, chili powder, salt and pepper. You can add diced green chiles or jalapenos, too. Migas are often served with a side of black beans, sliced avocado and a Bloody Mary, because, well…Migas are great hangover food! 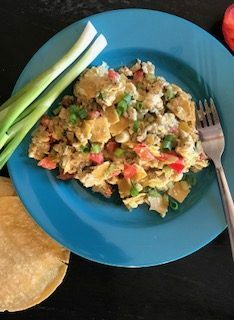 Some will argue that migas and chilaquiles are the same. According to Texas Monthly, while the two dishes are quite similar, they are not the same but many restaurants use the terms interchangeably. How Do I Make Migas? 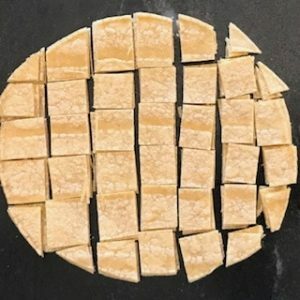 First, cut the tortilla into bite sized pieces. Then slice onions, peppers and tomatoes. Melt butter in a skillet; add tortillas and cook for about 3 minutes; then add the vegetables, seasonings, and stir. Finally, add in beaten eggs and continue to stir until eggs are the desired consistency. At this point, some people like to add cheese, or slice an avocado to go alongside. I prefer to eat the Migas as soon as possible because they are delicious when they’re hot! Corn tortillas are the only ‘white’ carbohydrate in this dish and are gluten-free. What Type of Skillet Do I Cook Migas In? It doesn’t matter. Normally, I recommend using a non-stick skillet for eggs, but in this case, since you are already cooking the tortillas and vegetables in the same skillet, you could use cast-iron; there’s probably enough oily residue from the vegetables to prevent the eggs from sticking. South of the border scrambled eggs with corn tortillas, onions, peppers and seasonings!